After the last lot of spring tides when the bass were active for one evening and then disappeared I had a couple of carp fishing sessions. To be honest the carp have become fairly iffy about dogbiscuits in this hot weather. This is not to say that they will not take them, they will, but they seem quite shrewd about rejecting the one with a hook attached. 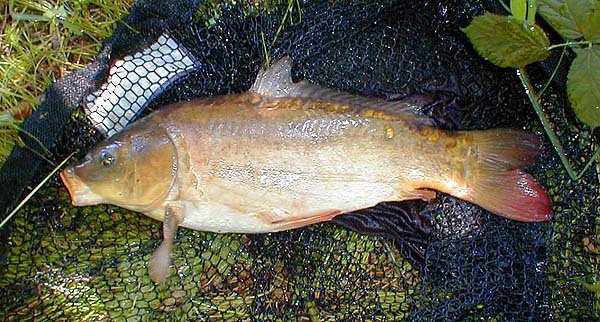 I think that everyone should be made to fish for carp off the top occasionally just to see that not all fish are catchable. Anyway, to cut a long story short the best way to catch a carp on floaters seemed to be dangling it in the margin among the mass of dead leaves and reeds blown in by the breeze. I managed a fish a trip (two hour session) and missed/lost a few others in the process. After my tussles with carp I needed a fix of sea fishing so I had one early morning session along the Purbecks. As I walked along the beach I met four blokes who had been out all night (those were the days) fishing for conger and huss - they said they had only had a few smallish fish. Anyway they did better than me. 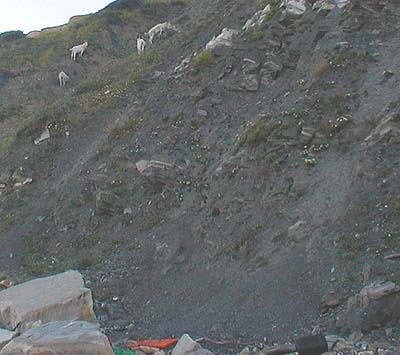 The bass seemed to be totally absent and the only excitement was seeing some feral goats on the cliff. 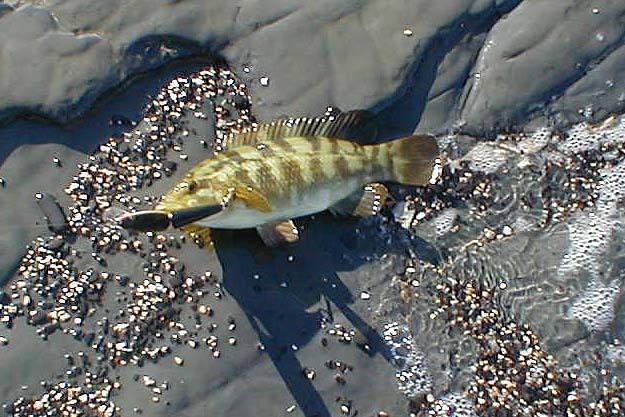 On my way back I decided to try and save the day by catching a wrasse so I waded into the shallow water and fished my J11 over the wrack beds. Sure enough it was not long before I had a tapping bite and hooked a small ballan. Shortly afterwards I had a second fish of similar size and after missing a third bite I packed in and went for breakfast. 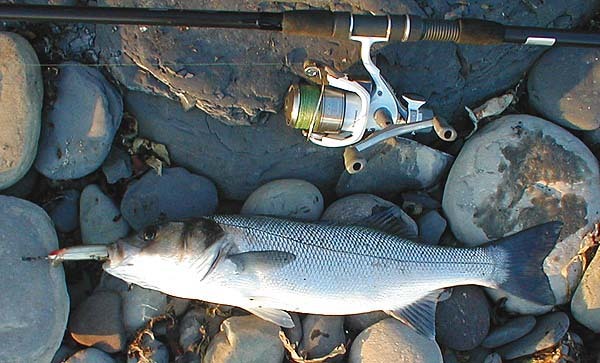 A few days later I had arranged to take a new acquaintance, Peter, fishing for mullet and bass. Peter is mostly a game fisherman and I had chosen what I thought would be a good tide but was not too hopeful of the conditions. I knew that the hot weather would have dried up all the maggoty weed and with a calm sea the prospects for surface feeding fish were poor. Anyway, we arrived at the shore well in advance of high water and decided to try plugging (I thought it would be the best chance of a bass unless we saw surface activity). It was calm and sunny with a stiff left-right, east wind that made casting tricky and as we fished another chap using fly tackle joined us. As it turned out we could not buy a bite for some time although the fly man had three schoolies on a Clouser minnow. His fish came all in a short space of time suggesting that it was a passing shoal. Peter and I plugged away and eventually I was pleased to get a fierce bite and land a fish of over three pounds which fought really well and christened my new reel. I missed a second bite and a bit later dropped another fish which cleared the water with the plug in its mouth before coming unstuck. We decided to pack in as the tide and darkness were both falling. We were almost back at the car when I noticed a few fish (some of them certainly mullet) feeding in the edge of the sea. We put the gear down, picked up the rods and in the gloom began to fish. 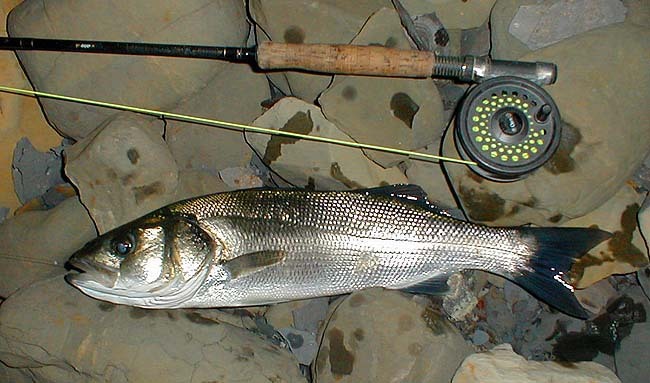 It was too dark and too late to fiddle about changing lures so I was using a tiny silver redgill on the fly rod in hopes that there were some bass in the shoal. Within minutes I was into a fish which took a few yards of line before coming off - certainly a bass. Five minutes later I had another take on the little eel and this time after a longish struggle, landed a bass similar to the one I had caught on the plug earlier. The eel was right inside its mouth. 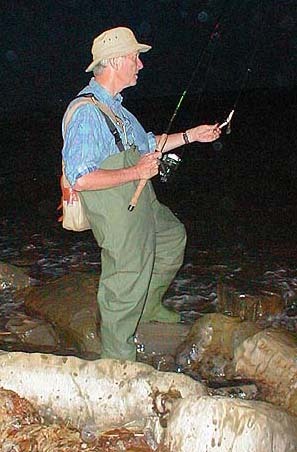 I left Peter still fishing in the dark and promising to "return tonight for another go". It's an early start for me tomorrow (grandchildrens sportsdays in Littlehampton) so I hope that Peter catches a few fish on my behalf.